Guest Cottage Great Room with Kitchen, Dining, and Living areas. Guest Cottage Queen size bedroom # 1 with under bed storage. Guest Cottage Double Bedroom # 2 with Twin bunk bed overhead. This oceanfront newly renovated home (2017) with two accompanying newly renovated guest cottages (2016) offers it's vacationers the unique experience of seaside living at your doorstep. It is a perfect setting for getting together with families and friends with closeness and privacy. The property accommodates 16 among the three cottages. Newly installed central air conditioning and heat is provided in all three cottages for your comfort. 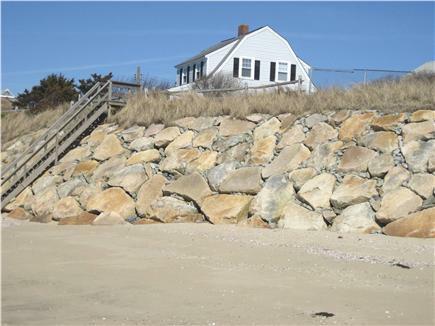 Breath-taking views of Nantucket Sound on a safe, sandy, warm water beach highlight this rental which includes 3 houses, with 7 bedrooms, 4 full bathrooms and 3 kitchens. Enjoy the luxury and relaxation of living by the ocean's edge, smelling the salt air, feeling the southerly breezes, bathing in the warm salt water, catching a fish from the jetties, or walking along the miles of open beach collecting shells at low tide. Or, you can just sit and watch the waves and the boats sail by. This property is like a rare gem. The main house, with two full baths, overlooks the ocean with views from the living room, enclosed sun porch, fully equipped granite with kitchen with island seating for three, new stainless appliances, and 3 bedrooms. 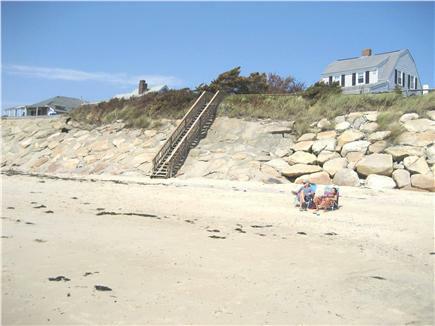 Use our private stairway to step down to your own beach. The 2 adjacent cottages have ocean views from the combination great room, kitchen, and dining areas; new wood flooring, and each feature 2 bedrooms and a full bath with tub. The compound has 3 additional sleep sofas located in the great rooms of the 3 houses for any overnight guests. This family friendly property is ideal for ocean front dining on the stone patio, taking long walks along the sandy beach, and swimming and water sports in our warm Nantucket Sound. No need to drive or walk any distance as you are at the beach! Plenty of additional activities available when you can tear yourself away from our beach such as shopping, grocery stores, restaurants, children's entertainment, theaters, golf, biking, and local fishing charter boats are all nearby. Teach your children how to cast for blues and stripers from your beach, or take the ferry to visit nearby Monomoy Nature Preserve or the Islands of Nantucket or Martha's Vineyard on a day trip. Professionally cleaned and caringly maintained by our on call staff for your carefree enjoyment. Newly renovated and nautically decorated with sensitivity to the unique charm of Cape Cod's South Beach. The main house has wood floors throughout and an open granite kitchen with island, dining, and living rooms. The main room opens onto the Nantucket Porch with a large glass slider, doubling the size of the living room, for ease in entertaining. The Nantucket Porch has a wicker lounge set and a matching dining set, great for breakfast in the morning, watching the ocean, or playing cards at night with friends. There are three lovely decorated bedrooms upstairs, one bedroom has a queen bed, one bedroom has a set of twins, and the third bedroom has a double bed (sleeps six total in bedrooms). There are two full baths, one off the kitchen downstairs and one upstairs. There is also an outdoor shower so you can rinse off after swimming. There are plenty of decks, outdoor furniture, and both a new four burner gas grill and charcoal grills for outdoor entertaining. Each of the additional two cottages has wood floors and can accommodate a family of five. Each cottage has two bedrooms, one bedroom has a queen bed, and the other bedroom has a full size bed with a twin bunk bed overhead (sleeps five total in two bedrooms). The house and the two cottages have newly installed central air conditioning,heat,and ceiling fans for comfort during your vacation. For additional overnight guests, the main house has a queen size sleep sofa in the living room. Each cottage has a full size futon sleep sofa in the great room. I supply sheets, pillow cases, bedspreads, blankets, and pillows. The kitchens are fully applianced with gourmet cookware and plenty of dinnerware for barbecues and entertaining. Please no large events, tents, or parties allowed on the property. Parking is available for six cars maximum. Additional availability info: Three bedroom house is available separately during off-season. See property ID 21457. This is a Saturday to Saturday vacation rental. The guest cottages each have ramps, first floor bedrooms and first floor bathrooms. Can't say how pleased we were with the property. Great private location that is close to where we had a wedding at the Pelican House. The property was clean and comfortable. The 2 back houses were perfect for our families. You won't be disappointed with this place. The owner was responsive and security deposit returned a few days post our stay. Grills outside and a great view! We had a very sunny week! The central AC was a godsend! Beautiful outdoor yard for family to gather. Nice hot/cold outdoor shower (not enclosed) for rinsing off salt and sand. Main house completely updated and fabulous. Guest cottages have many updates. Plenty of room to spread out. Excellent private beach. Hope to be back next year. Adele, thanks for offering your home up to us. We celebrated my 60th birthday here with family from France, Holland, Arizona, and NY, and it was fantastic!!! Having three separate living quarters was perfect, plenty of room for large dinner parties, so wonderful to be on the beach and the kitchen is superbly appointed!!! We all give it a TEN!!! And we will be back!! Love returning year after year! Our large family (grandparents, parents, children!) loves this beach property! We've been renting since 2010, and we look forward to returning every year. The large central house is great for everyone to gather, and the two cottages give nice spaces for the kids to nap or for adults to get some quiet time. The beach is beautiful, and the quick access makes taking the kids to the beach easy and fun. Every year the property gets better with improvements like AC. All 15 of us (10 adults, 2 teenagers, 3 children) had a wonderful time. The beach was perfect, varying from very calm to a mild surf. The house and cottages provided ample space and amenities; some bedrooms had a view of the ocean. The owner was exquisitely responsive to any maintenance issues, having them attended to immediately. We could enjoy walks and bike rides on local roads, with restaurants and ice cream shops nearby. A short ride brought us to some antique stores. Several of us went on a fishing trip, played miniature golf, or biked on the Cape Cod Bike Trail. The outdoor grills worked well, and we ate many meals on the outside chairs and benches. When my family (my parents, sister and brother) made plans to spend our summer vacation together, along with our respective families, we knew it would be best if we had separate houses. We love each other but we knew that spending 2 weeks under the same roof would be too much! This property was ideal because the main house allowed us to organize big family dinners, while the cottages enabled us to have quiet times. Plus, there was the location: directly on a private beach! With young kids, we could not have asked for more. As my sister said: we have a great schedule here "breakfast, beach, lunch, beach, dinner, ...". We had views of the ocean from all the houses. Even from the cottages. And although there are many cottages surrounding the property, it was very quiet at night and we had a lot of privacy. This spot is the best place for vacation or family reunion. I have rented this home for the past 2 years. My family comes to see us from all over the country. Perfect location. The people are so nice. The neighbors I've met are now friends. So many things to do with the kids close by. Dan the caretaker is there with anything you need. No more relaxing place on Cape Cod.